The term refers to the combination of two disciplines, hydrology (the study of water, how it circulates and where it occurs, its chemical and physical properties, and how it is distributed) and forest (the study of forests and their component parts). When combined the field covers how water systems operate in and about forests, in contrast for instance on open agricultural land. Forests soak up water, filter and distribute it. Some water is sent back into the atmosphere through evapotranspiration. 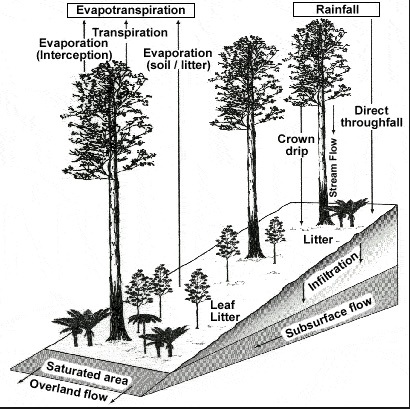 The remaining water falls onto the top of the forest from rain, runs down through the leaves onto the soil of the forest floor, where it continues to feed water back into the trees or recharges groundwater under the forest floor or flows off into surface waters including streams, rivers and lakes. The importance of this process can be seen from the fact that in the US, for example, approximately 80 percent of U.S. fresh-water resources are estimated to originate in forests, which cover one-third of the U.S. land area. In Europe, forests also cover about 1/3 of the land. Much of the focus in forest hydrology is in managing the forest to maximize the protection and distribution of the water. Locate the forest nearest to you. 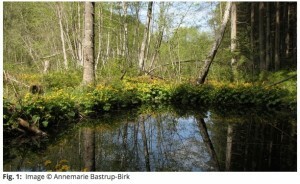 See definition of “forest” in The EEA Report on the Water Retention Wonders of Forests (below). See if you can determine the source of waters entering into and discharging from the forest. Determine the characteristics of the soils in the forest. Based on this information, and any other data you can collect, determine what actions might be taken to promote the retention of water in the forest and to preserve the quality of the water. Be sure that any actions you propose do not negatively impact on any biodiversity of the forest. 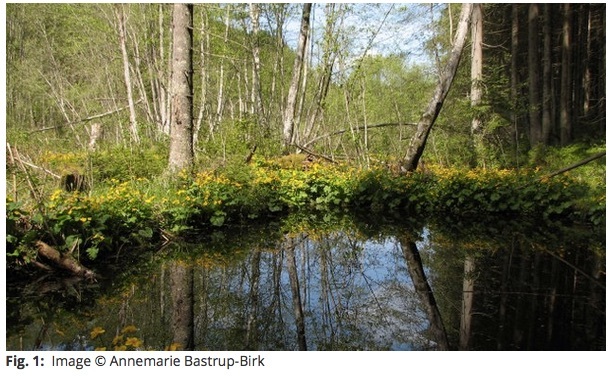 “I think that I shall never see/A poem lovely as a tree”:The EEA Report on the Water Retention Wonders of Forests in the Reports section of the current issue of irish environment (Dec 2015).